Heavy Duty Reusable Box For Hal. Elegance Packing Case For Ge Medical Systems. Manufacturer of packaging boxes, pallets, aluminum barrier foil covers, silver wood boxes etc. Also offering designing development services. 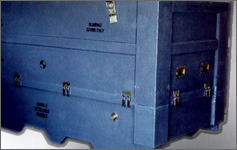 Heavy-duty reusable box for Hindustan Aeronautic Limited made of silver wood, plywood and painted with fibre coating to make it water-resistant. Custom-made PU foam slot in to provide protection for the heavy and sophisticated equipment. 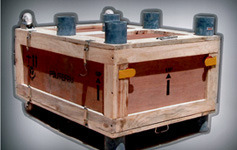 Box made of pinewood and plywood with necessary PU foam contours, unique clamps to effortlessly dismantle and assemble the box quickly, aluminium barrier foil for vacuum sealing, silica gel to absorb the moisture present in the air and prevent the equipment from rusting, air-bubble film, and polythene cover on the equipment, rubber beadings, stickers to indicate operational instructions and fumigation as per ISPM15 for export. 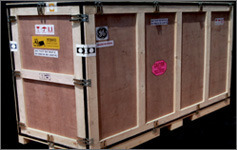 Fru packing box for GE Medical systems made of pinewood and plywood with pipe handles and magnetic stoppers, MS handles, dampers on top and bottom, castor wheels on top and bottom, inside PU foam, rubber pads and partitioned cabinets for the equipment, spares and document holders, unique clamps to open and close the box without the help of any tools, stenciling to indicate operational details and other product details. 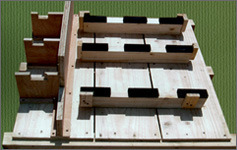 Pallet made of pinewood and plywood with necessary hardware, adhesives, provision for fork lifting and rubber pads on the contours. The pallet has also been fumigated as per ISPM15 for export use. 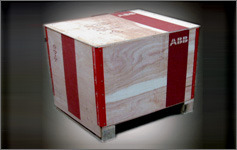 Packing case for ABB made of silver wood and silver finish plywood with bolts, nuts and MS base plate for bottom, corner clamps for sides and ends, rivets for corner clamps and PU foam. The packing case is also screen printed to indicate operational instructions and other product details. 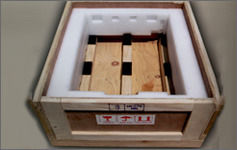 Wooden packing boxes made of pinewood and plywood with PU Foam, base with rubber pads and high density foam, stickers indicating handling instructions etc. Export quality corrugated boxes( 7 ply and 5 ply) with corrugated buffers, EP foam cut outs, edge board, stretch Film, stickers, sealing wire, adhesive tapes, PVC Straps etc.